Joseph M. Roman, 95, died peacefully surrounded by family on Monday, Feb. 4, 2019, at the Jerome Home in New Britain. He was the son of the late Ludwig and Helena Romanowski. He was predeceased by his wife of almost 65 years, Margaret (Lafayette) Roman, who passed in 2012. Joe was born in New Britain, on April 3, 1923. His parents died when he was very young and he was raised by Catholic nuns at orphanages in both New Britain and New York City, which formed his devout Catholic faith and membership in the Knights of Columbus. He joined the U.S. Marine Corps in 1942 and served as a radio operations specialist directing radio communications between command and combat air and land forces on both Guam and the pivotal battle of Iwo Jima Pacific Theater campaigns. He was honorably discharged in December 1945. Following his military service, Joe attended St. John’s University in New York and graduated from New York University in 1950. He moved back to New Britain with his wife and commenced a long career in the transportation industry working for the Middle Atlantic Transportation Company, and the Connecticut Motor Transport Association. Joe was an active Marine veteran and member of the Iwo Jima Survivors Association and could always be seen representing World War II veterans in local parades and events. In 2015, Joe was honored for his service to our country at the DAV Hardware City Chapter 8’s Golden Kielbasa Veterans Open and in December of that year, received a Proclamation from New Britain Mayor, Erin Stewart, in honor of his service to his country during the epic battle of Iwo Jima. He loved baseball especially his beloved Boston Red Sox and every season enjoyed the rivalry with his New York Yankee fan family members. A loving father, grandfather, great-grandfather, brother, and uncle, Joe is survived by his three sons and their wives, Michael and Karen of Vienna, Va., John and Janet of Kensington, Conn., and Joseph and Kathleen of Enfield, Conn. He leaves six grandchildren, Kristine Clinese, Michelle Powstanski, Dennis Roman, Carolyn Roman, Tamara Roman, and Tyler Roman. He leaves five great-grandchildren, Kayla and Joey Clinese, Ella, and Ethan Powstanski, and Scarlett Houghton. He was predeceased by his sister, Marion Stevens in 2015, and infant grandson, Christopher Roman in 1979. He also leaves loving nieces, Marianne Sheran, and Sonia Rios, and his faithful buddy and nephew, Dr. Nick Catsos, along with many great nieces and nephews. The family of Joseph M. Roman would like to extend our sincere thanks to everyone for their support, thoughts, and prayers, especially over the last few weeks. A special thanks goes to the staff and residents of Arbor Rose, who were dad’s close friends and companions for the past six years. And finally, to his doctors and nurses, and the medical staff at the Hospital of Central Connecticut and Jerome Home who cared for and helped dad in his final days. A brief gathering will be held Monday, Feb. 11, at 8:45 a.m. in the New Britain Memorial-Donald D. Sagarino Funeral Home, 444 Farmington Ave., New Britain, followed by a Mass of Christian Burial at 10 a.m. in St. Paul Church, 467 Alling St., Kensington, Conn. Committal with full military honors will follow in St Mary Cemetery, New Britain. Visitation will be on Sunday, Feb. 10, from 2 to 5 p.m. in the funeral home. 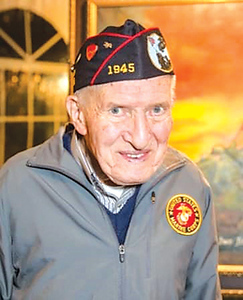 In lieu of flowers, the family suggests donations be made in Joe’s name to Iwo Jima Survivors Association, Inc. c/o Vincent Thomas, 35 Hemlock Road, Branford, CT 06405, 203-488-7683, VincentThomas@comcast.net, House of Heroes Connecticut, 3000 Whitney Avenue, Suite 233, Hamden, CT 06518, or donate online at www.hohct.org . Jerome Home and Arbor Rose, 975 Corbin Ave., New Britain, CT 06052. For directions and online condolences, please visit newbritainsagarino.com. Posted in New Britain Herald, on Wednesday, 6 February 2019 19:13. Updated: Wednesday, 6 February 2019 19:15.